Family physician practising in Ottawa, Ont. Clinical pharmacist with the Bruyère Academic Family Health Team and Assistant Professor in the Department of Family Medicine at the University of Ottawa. Objective To estimate the cost savings that could result from implementation of a rational prescribing model for drug classes that are equivalent in terms of efficacy, toxicity, and convenience. Design The top 10 drug classes based on annual spending were gathered from the Canadian Institute for Health Information. They were reviewed for potential inclusion in the study based on the ability to compare intraclass medications. When equivalence in efficacy, toxicity, and convenience was determined from a literature review, annual prescribing data were gathered from the National Prescription Drug Utilization Information Systems Database. The potential cost savings were then calculated by comparing current market shares with potential future market shares. Main outcome measures Estimated differences in spending produced by a rational prescribing model. Results Statins, proton pump inhibitors, angiotensin-converting enzyme inhibitors, and selective serotonin reuptake inhibitors were determined to have class equivalence for efficacy, toxicity, and convenience. Total current annual spending on these classes is $856 million through public drug programs, and an estimated $1.97 billion nationally. Through rational prescribing, annual savings could reach $222 million for public drug programs, and $521 million nationally. Conclusion Most of the potential savings are derived from deprescribing the newest patent-protected medications in each class. Avoiding prescribing the newest intraclass drug, particularly in the absence of research to support its superiority in relevant clinical outcomes, could lead to considerable savings in health care expenditures and might push the pharmaceutical industry to innovate rather than imitate. As prescribers, we strive to choose the best medications for our individual patients. However, our prescribing habits also have relevance on a national level and are potentially contributing to expanding health care costs. In Canada, health care spending comprises one of the largest sectors of both public and private expenditures, representing an estimated $214 billion in 2014, more than 11% of the nation’s gross domestic product.1 With an estimated annual cost of $29.3 billion, prescription pharmaceuticals represent the third largest portion of health care spending.1 Despite many commonplace medications coming off patent in recent years, annual spending remains quite high. Many guides to rational prescribing exist.5,6 The approach discussed here represents an intersection of the key principles from numerous prescribing methods. The framework of prescribing based upon efficacy, toxicity, cost, and convenience is not a novel one and has been discussed in multiple areas of the literature.7–9 Box 1 outlines this rational prescribing model. These 4 principles should not be weighted equally. If a drug is not effective, then the other 3 are likely of little importance. Conventionally, if medications are effective, as demonstrated by clinically relevant outcomes (reductions in mortality before morbidity and reductions in morbidity before symptomatic relief, as well as large effect sizes, higher-quality evidence, and time to benefit), then toxicity can be counterbalanced in a benefit-risk analysis. Toxicity analysis should also examine relevant outcomes, effect size, the quality of evidence, and time to harm. Finally, cost and convenience should be taken into account to improve compliance and minimize overall costs. Convenience. Differences could include route, frequency, and timing of doses. Drug monitoring requirements, potential for drug interactions, and the setting of administration also play key roles in determining the patient’s compliance with prescribed regimens. The purpose of this paper is to demonstrate the potential financial savings of prescribing based on cost, in cases where efficacy, toxicity, and convenience are equivalent. The medication classes included in this study were chosen from the 10 classes with the highest national spending, as determined by the Canadian Institute for Health Information (CIHI).1 Classes were excluded if they had only 1 drug available, if intraclass medications had differing prescribing indications, or if the heterogeneity of dosing frequency precluded comparison. After selecting classes, a literature review was performed using PubMed and Google Scholar, searching for systematic reviews or meta-analyses that compared clinical outcomes for all medications in the class. When only surrogate marker data were found, they were noted but not used to determine superiority. Further, Canadian clinical practice guidelines were obtained for the therapeutic indications of the studied medication classes to determine whether there was implied class equivalence within the guideline. Implied class equivalence existed if there was a dose equivalence table or if the class of medications was mentioned simply as a unit, rather than by individual drug. Total current annual spending was calculated as the sum of the 2013 NPDUIS data for the studied classes, providing a total spending figure for public drug programs. This figure was then extrapolated from the public spending figures to a combined nationwide total. Rational annual spending was calculated based on efficacy and tolerability data from a literature review of the studied classes. A “nonswitching” constant was determined for each class, defined as the percentage of people who would likely tolerate and get clinical effect from the least expensive medication. Market shares were calculated by cascading down the medications from least expensive to most expensive, using the nonswitching constant. The least expensive medication would receive an x% market share (where x is the nonswitching constant), the next cheapest medication would receive x% of the remaining market share, and so on. When the constant was sufficiently low, extra claims would be added to the most expensive drug. While we would not expect a full cascade through the class to be done in a real-world setting, it was done in this study in order to provide a conservative estimate of the savings potential. The study received ethics approval from the Bruyère Continuing Care Research Ethics Board in Ottawa, Ont. The top 10 classes, in terms of total public spending in 2012, are listed in Table 1, along with any exclusion criteria met by the individual classes.1 Based on these criteria, the classes included in this study are β-hydroxy-β-methylglutaryl-coenzyme A reductase inhibitors (statins), proton pump inhibitors (PPIs), angiotensin-converting enzyme inhibitors (ACEIs), and selective serotonin reuptake inhibitors (SSRIs). 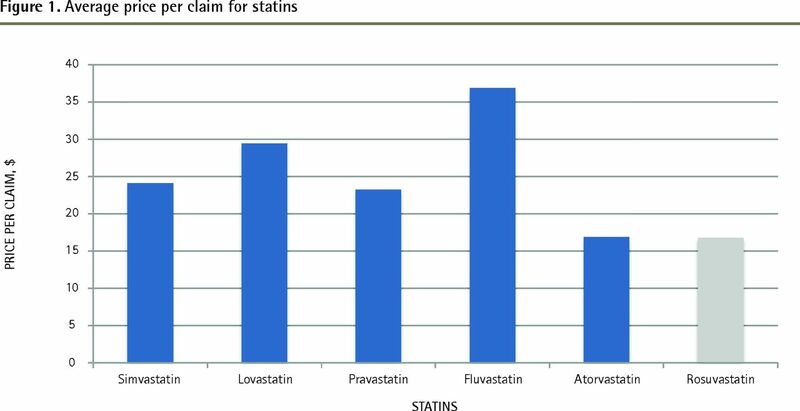 A review of the literature found numerous head-to-head comparisons of statins, comparing surrogate markers such as low-density lipoprotein levels, high-density lipoprotein levels, proteinuria, and adverse events.15–17 However, despite differences in surrogate markers, there remains insufficient evidence that there is a superior statin for cardiovascular outcomes, including mortality, myocardial infarction, or stroke.18 Adverse events and tolerability are equivalent among statins and are dose-dependent. All statins are recommended as a once-daily oral dose and are thus equivalent when comparing convenience. A Drug Class Review on statins, by Oregon Health & Science University’s Drug Effectiveness Review Project, concluded that the statins are equivalent when using equipotent doses.19 The newest Canadian clinical practice guideline to address statins, the C-CHANGE (Canadian Cardiovascular Harmonization of National Guidelines Endeavour) 2014 guideline, makes no distinction between individual statins and relies simply on a class recommendation.20 Therefore, the available evidence supports class equivalency for statins in terms of efficacy, toxicity, and convenience. A review of the literature revealed only a few comparison reviews. A meta-analysis found that esomeprazole and other PPIs showed similar efficacy in Helicobacter pylori eradication.21 For the treatment of erosive esophagitis, a comparison of histamine-2 (H2) blockers and PPIs found PPIs to be superior to H2 blockers, but equivalent within their class.22 Further, multiple single-trial head-to-head comparisons of PPIs have been done, which all have conflicting conclusions.23–26 Generally, PPIs are very well tolerated, with a cross-class discontinuation rate around 1%.27 They generally involve a single daily oral dose, although twice-daily dosing is possible across the class. A PubMed Clinical Q&A on PPIs found them to be equivalent.28 Two Canadian clinical practice guidelines were identified, addressing gastroesophageal reflux disease and H Pylori eradication. In the gastroesophageal reflux disease guideline, all PPIs were listed as treatment options and no distinction was made between them.29 In the H Pylori guideline, there was no distinction made between PPIs and a class recommendation was given.30 Therefore, the available evidence supports class equivalency for PPIs in terms of efficacy, toxicity, and convenience. A review of the literature revealed multiple systematic reviews and meta-analyses, each looking at specific case uses. However, most of these studies concluded there was class equivalency when treating post–myocardial infarction31 and congestive heart failure.32 Important adverse events and discontinuation rates are similar for all ACEIs.33 Generally, ACEIs are prescribed as a single daily oral dose; however, captopril requires 3 doses per day owing to a shorter half-life. A PubMed Clinical Q&A on ACEIs found no data to support intraclass differences.34 The most recent Canadian clinical practice guidelines, the Canadian Hypertension Education Program 2014 hypertension guideline, the Canadian Cardiovascular Society guidelines for stable ischemic heart disease (2014) and heart failure (2012), and the Canadian Society of Nephrology 2008 guideline for chronic kidney disease, make no distinction among ACEIs for any use, simply referring to the class as a unit.35–38 Therefore, the available evidence supports class equivalency for ACEIs in terms of efficacy, toxicity, and convenience, excluding captopril owing to its lower convenience. A review of the literature revealed a small number of systematic class reviews as well as multiple meta-analyses comparing escitalopram to other SSRIs. The available research supports a small benefit in surrogate markers for escitalopram, including depression scale score differences of minimal clinical relevance.39 However, there was no identifiable research to support a difference in mortality, hospitalizations, job loss, or attempted or completed suicide rates. Differences in potential adverse effects are only a few percentage points apart as well, leading to little real-world significance and few reasons to choose it first. A systematic review and meta-analysis on SSRIs found similar efficacy in the treatment of major depressive disorder but was not able to draw conclusions for other mood or anxiety disorders owing to a lack of available research.40 Canadian clinical practice guidelines for depression and anxiety disorders were identified. The depression guideline considered all SSRIs as first-line therapy.41 The anxiety guideline recommended different SSRIs based on specific anxiety disorder. However, by far most of the stated differences between first-, second-, and third-line therapies were based on drugs that were specifically studied for the indication and not based on proven superiority.42 Individual SSRIs do come with differences in receptor specificity and pharmacokinetic profiles, which might affect individual rates of tolerability. However, population averages of tolerability show few clinically relevant differences. Generally SSRIs are prescribed as a single daily oral dose, thus negating any differences in convenience. Therefore, while the pharmacokinetic properties of SSRIs might lead to different adverse event profiles, the available evidence supports class equivalency of SSRIs in terms of efficacy, toxicity, and convenience. For each medication in the 4 classes included in this study, public drug program prescription volumes and spending figures were obtained through NPDUIS. Tables 2, 3, 4, and 5 summarize the total prescriptions and spending figures from 2013 for statins, PPIs, ACEIs, and SSRIs, respectively. Figures 1, 2, 3, and 4 show the average cost per prescription for statins, PPIs, ACEIs, and SSRIs, respectively. While prices vary slightly by province, the average price per claim across Canada demonstrated that the least expensive medications in each class are rosuvastatin, rabeprazole, ramipril, and citalopram, respectively. Total current annual spending for the 4 studied classes in public drug program spending was $856 million. In order to estimate the total spending Canada-wide, from both public and private sources, the totals in each class were corrected according to published public versus private portion data. For statins, PPIs, ACEIs, and SSRIs, the total portions that were publicly funded were 47%, 43%, 50%, and 35%, respectively.14 This led to a combined total current annual spending of $1.97 billion. The rational annual spending calculation required determination of the portion of patients who, when prescribed their first medication, were not likely to change to another intraclass medication. It was deemed that patients would primarily switch intraclass medications based upon tolerability for statins and ACEIs and based upon efficacy for SSRIs and PPIs. Table 6 summarizes the tolerability and efficacy data found for each class, as well as the least expensive medication within the class.33,43–47 Conservative nonswitching constants were chosen and were 94%, 80%, 92%, and 60%, for statins, PPIs, ACEIs, and SSRIs, respectively. Estimated market shares were calculated using these constants and were compared with current prescribing patterns in Tables 7, 8, 9, and 10. Determination of “nonswitching” constant: The nonswitching constant was the proportion of patients who, when prescribed their first medication, were not likely to change to another intraclass medication. Using these values, rational annual spending was calculated to be $634 million for public spending and $1.45 billion for combined spending. This would represent an annual cost-savings potential of $222 million in public spending and $521 million in combined spending. These findings are summarized in Tables 11 and 12. This study has found that, while looking at merely 4 classes of medications, the estimated annual savings is estimated at $521 million. While the calculations were limited by the necessity to estimate the exact public-to-private split and a reasonable future market share based on efficacy and tolerability data, it is unlikely that $521 million in savings is an overestimate. In fact, it might represent a large underestimation. The annual spending on the most expensive medications, often those still under patent protection, might be severely underrepresented in the NPDUIS database owing to lack of coverage across the provincial formularies. In fact, most of the potential savings found in this study can be attributed to deprescribing these new, expensive medications. Out of the $521 million in annual savings, $403 million, or 78% of the total savings, is the direct result of lower prescription volumes for escitalopram, esomeprazole, and perindopril. Further, according to a 2013 publication of Rx Atlas, the combined public and private spending for these 3 medications greatly exceeds the estimated combined data in this study. While this study estimates the total annual spending on these medications to be approximately $403 million, spending could be as high as $850 million, more than double our estimate.14 These data might demonstrate that public drug programs see underrepresentation of these medications, particularly esomeprazole. Esomeprazole only represented $12 million in public drug program spending in 2013, while the Rx Atlas data claim an annual combined cost of $370 million.14 Simply targeting these 3 large-cost, small-reward medications could lead to a large proportion of the $521 million in savings found in this study, and might lead to nearly $1 billion in savings when other spending data are accounted for. There are limits to using data available in administrative databases. Data were not available for all provinces and territories, and we used a variety of assumptions to arrive at the estimated savings detailed in this article. We also only included 4 drug classes. However, it is more likely that our findings represent an underestimation than an overestimation of the potential savings. While this study did not look at the potential of prescribing from different classes (eg, H2 blockers in lieu of PPIs, serotonin and norepinephrine reuptake inhibitors in lieu of SSRIs, or angiotensin-2 receptor blockers in lieu of ACEIs), this would be an interesting future direction for research. When it comes to intraclass medications, newer medications do not necessarily represent better medications. However, they inevitably represent more expensive medications, at least during their patent-protection phase. The principles of rational prescribing—prescribing based upon efficacy, toxicity, cost, and convenience—can have vast implications on health care spending without compromising patient care or safety. The millions of dollars of potential savings could be reallocated to other high priority health initiatives. Rational prescribing should not be limited to these 4 medication classes. Prescribers must acknowledge drug costs and use them as a deciding factor when prescribing otherwise equivalent medications. At a minimum, costs should be taken into account as a tertiary consideration after efficacy and toxicity have been weighed. We call for a national comparator of drug costs to help facilitate prescribers’ choices. However, in its absence, merely avoiding the newest medications without clear improvements over existing criterion standard therapy, those with less accumulated safety data, and those still under patent protection, can lead to considerable health care savings. In 2013 in Canada, $29.3 billion was spent on prescription pharmaceuticals. A rational prescribing model, which compares efficacy, toxicity, convenience, and cost, might lead to considerable cost savings. This study aimed to quantify the potential savings that could result from the implementation of such a model. Of the 10 most commonly prescribed classes of medications, 4 were determined to have intraclass equivalence in terms of efficacy, toxicity, and convenience. The authors estimate that avoiding prescribing the newest intraclass drug for these 4 classes could save more than half a billion dollars annually, including $222 million in public spending. Lower prescription volumes for just 3 medications (escitalopram, esomeprazole, and perindopril) account for 78% of the total savings. Prescribers must acknowledge drug costs and use them as a deciding factor when prescribing otherwise equivalent medications. The lowest cost statin, proton pump inhibitor, angiotensin-converting enzyme inhibitor, and selective serotonin reuptake inhibitor are rosuvastatin, rabeprazole, ramipril, and citalopram, respectively. This article is eligible for Mainpro-M1 credits. To earn credits, go to www.cfp.ca and click on the Mainpro link. La traduction en français de cet article se trouve à www.cfp.ca dans la table des matières du numéro de mars 2016 à la page e146. Both authors took part in creation of the concept, interpretation of the data, writing and editing the manuscript, and approving the final draft.
. Prescribed drug spending in Canada, 2012: a focus on public drug programs. Ottawa, ON: Canadian Institute for Health Information; 2013.
. A cross-national study of prescription nonadherence due to cost: data from the joint Canada-United States survey of health. Clin Ther 2006;28(8):1217-24.
. Cost-related medication underuse. Arch Intern Med 2004;164(16):1749-55.
. Paying more, getting less: measuring the sustainability of government health spending in Canada: 2009 report. Toronto, ON: Fraser Institute; 2009.
. Rational prescribing: the principles of drug selection. Clin Med (Lond) 2009;9(5):481-5.
. I Can PresCribE A Drug: mnemonic-based teaching of rational prescribing. Fam Med 2007;39(4):236-40.
. The easy guide to good prescribing. Melbourne, Australia: National Prescribing Service Limited; 2001.
. Rational prescribing, appropriate prescribing. Br J Clin Pharmacol 2004;57(3):229-30.
. The unofficial guide to prescribing. Philadelphia, PA: Elsevier Health Sciences; 2014.
. Do family physicians know the costs of medical care? Survey in British Columbia. Can Fam Physician 2004;50:263-70.
. Physician awareness of drug cost: a systematic review. PLoS Med 2007;4(9):e283.
. Physicians’ attitudes about prescribing and knowledge of the costs of common medications. Arch Intern Med 2000;160(18):2799.
. Do drug costs affect physicians’ prescription decisions? J Intern Med 1997;241(5):415-20.
. The British Columbia medical and hospital atlas. Vancouver, BC: Centre for Health Services and Research Policy, University of British Columbia; 2013.
. Rosuvastatin is cost-effective in treating patients to low-density lipoprotein-cholesterol goals compared with atorvastatin, pravastatin and simvastatin: analysis of the STELLAR trial. Eur J Cardiovasc Prev Rehabil 2005;12(1):18-28.
. Comparison of cost-effectiveness, safety, and efficacy of rosuvastatin versus atorvastatin, pravastatin, and simvastatin in dyslipidemic diabetic patients with or without metabolic syndrome. J Prim Care Community Health 2014;5(3):180-7.
. Comparison of efficacy, safety, and cost-effectiveness of various statins in dyslipidemic diabetic patients. Indian J Pharmacol 2014;46(1):88-93.
. A systematic review and meta-analysis on the therapeutic equivalence of statins. J Clin Pharm Ther 2010;35(2):139-51.
. Drug class review HMGCoA reductase inhibitors (statins) and fixed-dose combination products containing a statin. Portland, OR: Oregon Health & Science University; 2009.
. Canadian Cardiovascular Harmonized National Guidelines Endeavour (C-CHANGE): 2014 update. CMAJ 2014;186(17):1299-305.
. A meta-analysis: comparison of esomeprazole and other proton pump inhibitors in eradicating Helicobacter pylori. Digestion 2006;73(2–3):178-86. Epub 2006 Jul 11. Erratum in: Digestion 2006;74(3–4):235.
. Head-to-head comparison of H2-receptor antagonists and proton pump inhibitors in the treatment of erosive esophagitis: a meta-analysis. World J Gastroenterol 2005;11(26):4067.
. Meta-analysis: comparing the efficacy of proton pump inhibitors in short-term use. Aliment Pharmacol Ther 2003;17(10):1237-45.
. A comparison of the acid-inhibitory effects of esomeprazole and rabeprazole in relation to pharmacokinetics and CYP2C19 polymorphism. Aliment Pharmacol Ther 2012;35(7):810-8. Epub 2012 Feb 13.
. Rabeprazole- versus esomeprazole-based eradication regimens for H. pylori infection. Helicobacter 2007;12(6):633-7.
. An open-label, parallel, multiple-dose study comparing the pharmacokinetics and gastric acid suppression of rabeprazole extended-release with esomeprazole 40 mg and rabeprazole delayed-release 20 mg in healthy volunteers. Aliment Pharmacol Ther 2011;33(7):845-54. Epub 2011 Jan 28.
. Review article: comparison of the pharmacokinetics, acid suppression and efficacy of proton pump inhibitors. Aliment Pharmacol Ther 2000;14(8):963-78.
. PubMed clinical Q&A. Bethesda, MD: National Center for Biotechnology Information; 2010. Comparing proton pump inhibitors. Available from: www.ncbi.nlm.nih.gov/books/NBK51075. Accessed 2016 Jan 22.
. Gastroesophageal reflux disease—clinical approach in adults. Victoria, BC: BCguidelines.ca; 2009. Available from: www.bcguidelines.ca/guideline_gerd.html. Accessed 2015 Feb 11.
. Helicobacter pylori. Edmonton, AB: Toward Optimized Practice; 2009. Available from: http://topalbertadoctors.org/cpgs/52018232. Accessed 2015 Feb 11.
. Is ramipril really better than other angiotensin-converting enzyme inhibitors after acute myocardial infarction? Am J Cardiol 2006;98(1):6-9. Epub 2006 Apr 27.
. Comparison of angiotensin-converting enzyme inhibitors in the treatment of congestive heart failure. Am J Cardiol 2005;95(2):283-6.
. 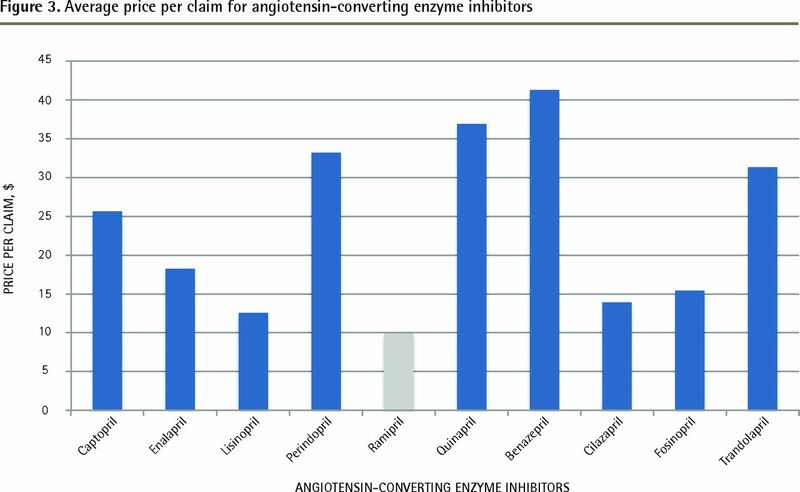 Systematic review: comparative effectiveness of angiotensin-converting enzyme inhibitors and angiotensin II receptor blockers for treating essential hypertension. Ann Intern Med 2008;148(1):16-29. Epub 2007 Mar 5.
. PubMed clinical Q&A. Bethesda, MD: National Center for Biotechnology Information; 2010. Comparing ACE inhibitors and related drugs. Available from: www.ncbi.nlm.nih.gov/books/NBK51071. Accessed 2015 Feb 11.
. The 2014 Canadian Hypertension Education Program recommendations for blood pressure measurement, diagnosis, assessment of risk, prevention, and treatment of hypertension. Can J Cardiol 2014;30(5):485-501. Epub 2014 Feb 22.
. Canadian Cardiovascular Society guidelines for the diagnosis and management of stable ischemic heart disease. Can J Cardiol 2014;30(8):837-49.
. The 2012 Canadian Cardiovascular Society heart failure management guidelines update: focus on acute and chronic heart failure. Can J Cardiol 2013;29(2):168-81. Epub 2012 Nov 30.
. Guidelines for the management of chronic kidney disease. CMAJ 2008;179(11):1154-62.
. Efficacy of escitalopram in the treatment of major depressive disorder compared with conventional selective serotonin reuptake inhibitors and venlafaxine XR: a meta-analysis. J Psychiatry Neurosci 2006;31(2):122-31. Erratum in: J Psychiatry Neurosci 2006;31 (4):228.
. Comparative risk for harms of second-generation antidepressants: systematic review and meta-analysis. Drug Saf 2008;31(10):851-65.
. Major depressive disorder in adults: diagnosis & management. Victoria, BC: BCguidelines.ca; 2013. Available from: www.bcguidelines.ca/guideline_mdd.html. Accessed 2015 Feb 11.
. Canadian clinical practice guidelines for the management of anxiety, posttraumatic stress and obsessive-compulsive disorders. BMC Psychiatry 2014;14(Suppl 1):S1. Epub 2014 Jul 2.
. Risks associated with statin therapy: a systematic overview of randomized clinical trials. Circulation 2006;114(25):2788-97. Epub 2006 Dec 11.
. Efficacy of rabeprazole once daily for acid-related disorders. Dig Dis Sci 2001;46(3):587-96.
. Direct comparative trials of the efficacy of proton pump inhibitors in the management of gastro-oesophageal reflux disease and peptic ulcer disease. Aliment Pharmacol Ther 2003;18(6):559-68.
. Tolerability of ramipril in a multi-center study of mild-to-moderate hypertension in general practice. J Cardiovasc Pharmacol 1991;18(Suppl 2):S141-3.
. Persistence, switching, and discontinuation rates among patients receiving sertraline, paroxetine, and citalopram. Pharmacotherapy 2005;25(5):660-7.